By Stellar Information Technology Pvt. 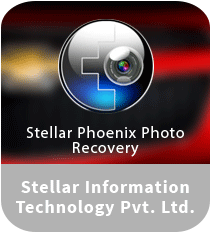 Ltd.
Stellar Phoenix Photo Recovery is one of the most popular media recovery tools for Windows that help you recover your lost, deleted, and formatted digital photos from local as well as removable media. You can easily retrieve your images, audios, and videos that have been accidently deleted from your PC. The Photo recovery software has such a simple yet interactive user interface that even a less-experienced user can easily work on it. There are 3 tabs available at system startup, namely Data Recovery, Resume Recovery, and Create Image. Using its Create Image feature, you’re able to create the image of entire storage device or selected area. With Resume Recovery, you’re allowed to resume the photo recovery operation anytime by using previously saved scanned information. Furthermore, you need to choose a storage media in order to start a scan operation. Stellar Phoenix Photo Recovery for Windows scans the selected storage device and displays the list of all photos and other media. During the scanning process, the application shows total size, files and directories along with found entries. It is possible to preview media and analyze file details such as name, format, size, etc. The latest version of Stellar Phoenix Photo Recovery allows you to see the preview of a recoverable file in 3 different views, namely List View, Thumbnail View, and Cover Flow View. One of the most useful features of this image manager is that you can select single as well as multiple files for recovery. The program supports a wide array of audio, video, and image formats. Download Stellar Phoenix Photo Recovery today to recover your lost photos, audio and video files without any difficulty. > Helps you recover your lost or deleted images, audios, and videos from HDD as well as other storage devices like memory cards, USB drives, etc. > Supported media formats: GIF, JPEG, PNG, WMA, WAV, AVI, etc. > Works smoothly with several storage devices such as hard drives, memory cards, digital cameras, USB drives, etc. Stellar Phoenix Photo Recovery is an effective image editing tool that can help you retrieve your lost or accidently deleted photos and videos from your hard drive. The scanning process is able to search files only in the selected area. Once the application has scanned the drive, it gives you the list of all files which it has recovered. Overall, Stellar Phoenix Photo Recovery offers a number of useful features and an interactive environment to help all types of users, regardless of their experience, for retrieving deleted files with ease.